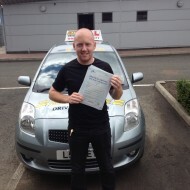 Thomas Cunningham PASSED his driving test with Accelerate Driving Lessons Glasgow! Thomas passed with only 3 minor faults which is BRILLIANT! Accelerate wish you the best Thomas – WELL DONE! 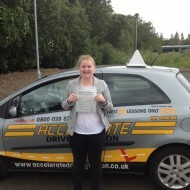 Well done to Kirsty who has passed her driving test first time ! With the help of Steven Love and our driving lessons in Glasgow Kirsty has managed to do very well in her driving test by only picking up 3 minor faults which is great ! Well done Kirsty ! Yet another pass with Accelerate ! When doing driving lessons in Glasgow our instructor Charlie Boyle was very pleased with Mark and the progress he made through his lessons ! 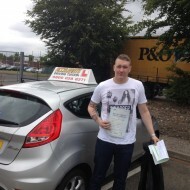 One more check on the pass book for Accelerate Driving Tuition – Well done Mark !! 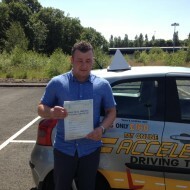 Jamie Moses passed first time with Accelerate Driving Tuition ! 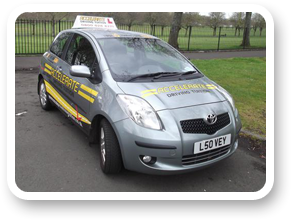 Yet another successful first time pass with Accelerate shows just how good our driving lessons in Glasgow are ! We love when our students pass, well done Jamie !! Accelerate are very pleased to let you all know that Martin Sweeny has now passed his driving test by doing some driving lessons in Glasgow with Accelerate ! 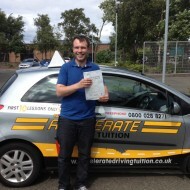 Martin has done very well and passed FIRST TIME with only two minor faults which is excellent. This once again shows how with the correct tuition you can do the very best ! Well done Martin !! 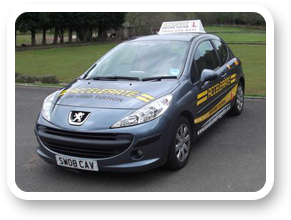 We are proud to announce that Asad Mamood has passed his driving test with Accelerate Driving Tuition ! 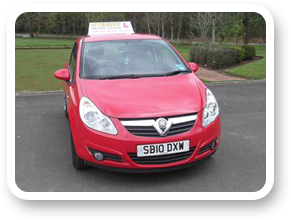 While doing his driving lessons in Glasgow Asad has performed extremely well in learning how to drive and handling the car perfectly. 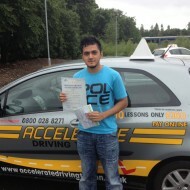 All his hard work has resulted in Asad PASSING his driving test with only three minor faults. Well Done Asad ! !